Greatness, in the world of art is a subjective judgment. However, Talin Lyman’s (formerly Johnson) judges and prized client list would suggest a consistent theme – others who have made great achievement their legacy seek out her works and designs. If the company she keeps is any indication, Talin too will be noted as a great achiever in the art and design world. Her one-of-a-kind musical painting rests in China at the home of the Chinese Ambassador. Two grand frescos can be found in Tuscany and in Rome at the Intercontinental hotels; each one over 120 square feet in size. Talin was even commissioned to paint a mural which now adorns a wall in the winter home of one of our famous U.S. vice-presidents. The list goes on. Dennis Max, famed south Florida restaurateur owns her paintings and rugs. 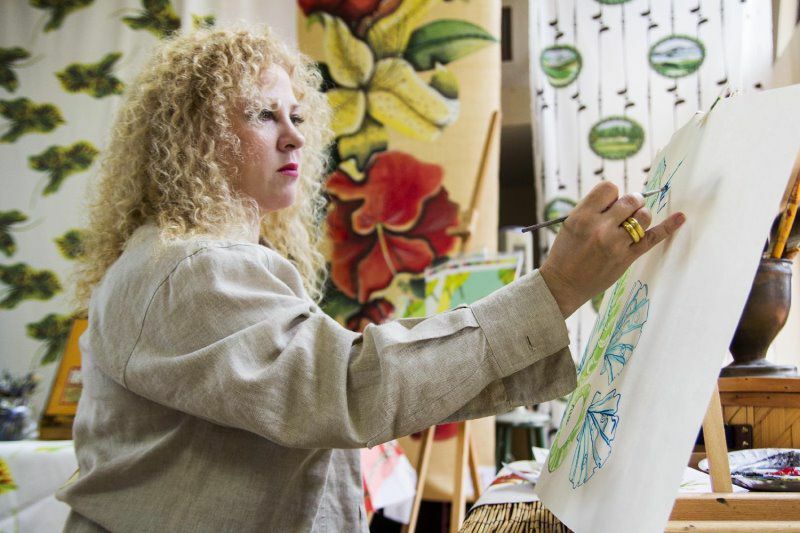 And Rainier Neuman, caterer to Donald Trump and other notables in Palm Beach fashions her exclusive fabric designs for his home. Talin gets her great talent from her parents. Talin’s mom is a creative decorator and gardener who’s home is frequently listed on the Nashville tour of homes. Her father was educated at Julliard and performed for the New York and San Francisco Opera Companies. He studied under the voice teacher of renowned tenor, Mario Lanza. After meeting and marrying her mom, Talin’s father became a full-time missionary and they traveled the world over. This exotic upbringing allows her to draw on many facets of nature, the constant theme in her works. Many of her tropical paintings are so inviting you are tempted to just step into the scene and breathe in its peace and pleasures. Others, though peaceful are more impressionistic and, like those of the masters, require you to remain outside the scene to take it all in. Her unique childhood also makes doing business with her a real pleasure. You see, she learned early on that life as we know it in America is very rare in most other parts of the world. So, Talin appreciates simple pleasures and the irreplaceable gifts of nature. Her work and personable manner reflects this attitude.